Wilms tumor (WT) or nephroblastoma is the second commonest neonatal renal tumor accounting for 20% of cases and represents the most important renal malignancy during childhood. This neoplasm develops from the primitive metanephric blastema, the primitive tissue of normal kidney, but it may be formed also by cell of nonrenal tissues. In neonates affected by nephroblastoma, only 16% of these are being diagnosed antenatally, and the rest are identified during investigation for maternal polyhydramnios, hydrops fetalis, or other congenital anomalies. Wilms tumor occurs in males and females equally, and in 1% of cases, there is a family history, and it is associated with various congenital syndromes [1, 2]. 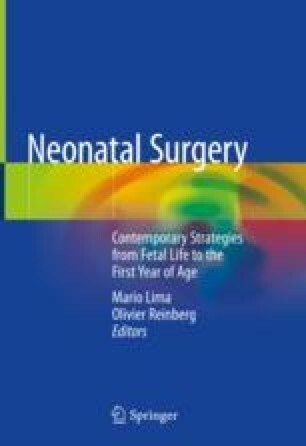 A recent AIEOP study reports that infants have a good prognosis than older children affected by WT because of a biological diversity and an earlier diagnosis occurring during screening test administered for the study of genitourinary abnormalities or genetic syndromes associated to early infancy . D’Angelo P, Di Cataldo A, Terenziani M, et al. Factors possibly affecting prognosis in children with Wilms’ tumor diagnosed before 24 months of age: a report from the Associazione Italiana Ematologia Oncologia Pediatrica (AIEOP) Wilms Tumor Working Group. Pediatr Blood Cancer. 2017;64 https://doi.org/10.1002/pbc.26644.